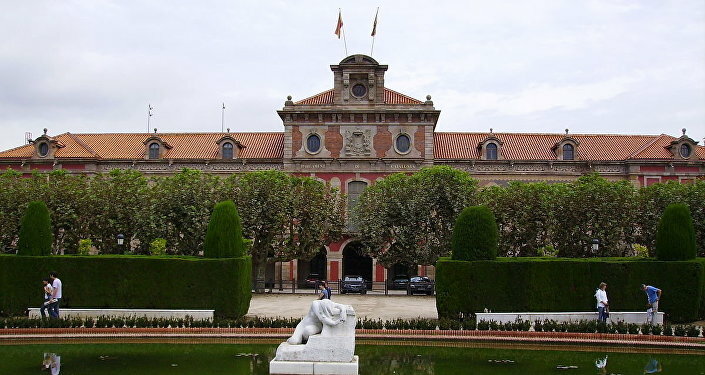 The parliament of Catalonia has passed a resolution to begin the secession process from Spain. Under the resolution, the separation process is expected to be completed by 2017 and it stipulates for the formation of the government and other state structures, as well as a constitution. “The resolution is obviously very important for us as in the past few years there has been an obvious majority in the streets and the social movement is very strong, showing our will for independence. It shows that this social movement has found its political action in parliament and that we are starting an institutional process to make independence effective for Catalonia. We are very excited about this because it is an official stamp of the beginning to make independence an effective reality,” Anna Arque — Catalan spokesperson for the 'European Partnership for Independence' – told Sputnik on Monday. When asked if the resolution could lead the way towards Catalonia’s independence from Spain, Anna Arque said that the Catalans had always favored independence by the means of a referendum. “We have always defended self-determination as a fundamental universal right of a people, which is a normal procedure in Scotland and other European countries, which have exercised this right, and we want to do the same. But the Spanish state does not want to talk about ballot boxes or people deciding in a democratic way,” she added. “It’s a good moment to actually ask the international community about who is going to step forward and say that these people are doing it all in a democratic way and that democracy is all about a government for the people, by the people and for the people, and we’ll see what Europe, the United States, Russia and other countries are going to say about it,” Anna Roque said in conclusion. Earlier Spanish authorities warned that if the vote in Catalonia’s parliament succeeds, Madrid will turn to the Constitutional Court. Spanish Prime Minister Mariano Rajoy has repeatedly said that independence referendums as well as other secessionist steps are unconstitutional and therefore are illegal. Catalonia is Spain’s wealthiest region, which produces 20 percent of national GDP. Many Catalans consider the rest of Spain as an economic burden on them. The confrontation between Barcelona and Madrid has intensified in recent years due to the economic crisis.